American physicist payload specialist astronaut 1989-1997. Status: Inactive; Active 1989-1997. Born: 1940-09-12. Spaceflights: 2 . Total time in space: 19.67 days. Birth Place: Jamestown, Tennessee. Grew up in Jamestown, Tennessee. Educated Tennessee Poly; Virginia Poly. Considers Jamestown, Tennessee, where he was born September 12, 1940, as his hometown. Currently resides in Laurel, Maryland. One daughter, two sons. Hobbies include traveling, photography, basketball, softball, camping, hiking, fishing, and whitewater rafting. His mother, Mrs. Maxine S. Crouch, lives in Jamestown, Tennessee. His father, Willard Crouch is deceased. Earned a bachelor of science in physics from Tennessee Polytechnic Institute in 1962, a master of science and a doctor of philosophy in physics from Virginia Polytechnic Institute in 1968 and 1971, respectively. He was a visiting scientist at Massachusetts Institute of Technology in 1979-80. As the Chief Scientist of the NASA Microgravity Space and Applications Division since 1985 he has served as the manager for a research program that supports materials science, fluid physics, low temperature microgravity physics, combustion science, and biotechnology. He had responsibility for assuring that experiments in the flight program achieved the highest levels of scientific results possible. 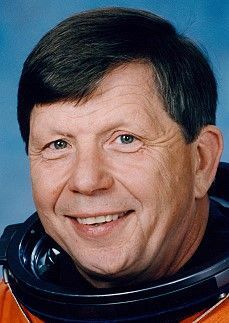 He served as Program Scientist on Spacelab J, the second International Microgravity Laboratory Program (IML-2), the first United States Microgravity Laboratory (USML-1) and a Program Scientist (Materials Sciences) IML-1. In addition, he helped organize and has served as co-chairman for Microgravity Science Working Groups between NASA and the European Space Agency, France, Germany, Japan and Russia. He was the co-chair of the International Microgravity Science Strategic Planning Group. He was the co-chair for the IML Science Working Group from 1985-1989. He has served on several governmental interagency panels on Materials Science, most recently as a team member assessing the potential for collaborative efforts between the U.S. and China. He was a co-principal investigator on an experiment that flew in the Materials Experiment Apparatus on the D-1 mission. Prior to working in NASA Headquarters, he had been at the Langley Research Center since 1962. His last position there was group leader of a research group investigating the effects of convection on semiconductor properties. He was a principal investigator in the MSAD flight program from 1977-1985. He has done research in various types of semiconductor crystal growth, electrical and optical properties of materials, electronic devices for remote sensing and flat panel displays and heat shield protection for reentry space vehicles. He trained as the Alternate Payload Specialist on STS-42 (First International Microgravity Laboratory). Most recently, he flew as a payload specialist on STS-83, April 4-8,1997. STS-83, the Microgravity Science Laboratory (MSL-1) Spacelab mission, was cut short because of problems with one of the Shuttle's three fuel cell power generation units. Mission duration was 95 hours and 12 minutes, traveling 1.5 million miles in 63 orbits of the Earth. Published over 40 technical papers and more than 40 technical presentations in various areas of research, concentrating since 1978 on semiconductor crystal growth and the influence of gravitational forces on materials properties. Floyd Thompson Fellowship 1979; Quality Increase 1972, 1986, 1988; Exceptional Service Award 1989; Outstanding Performance Rating, 1985, 1986, 1987, 1989, Certificates of Recognition 1973, 1975, 1976, 1977, 1979, 1980, 1981, 1984 (2), 1985, 1986, 1987 (3), Special Achievement Award, 1983, Sustained Superior Performance Award, 1989, Superior Accomplishment Award 1992, NASA Exceptional Achievement Medal 1995. Member of American Physical Society, American Association for Crystal Growth, Sigma Pi Sigma, Kappa Mu Epsilon. Dr. Crouch will serve as a payload specialist. on STS-94. The 16-day re-flight of the Microgravity Science Laboratory (MSL-1) Spacelab mission will focus on materials and combustion science research in microgravity. Launch is scheduled for the Summer of 1997 aboard Space Shuttle Columbia. Family: Astronaut. Country: USA. Flights: STS-83, STS-94. Projects: STS. Agency: NASA. Bibliography: 12, 5295. 1940 September 12 - . Birth of Dr Roger Keith Crouch - . Nation: USA. Related Persons: Crouch. American physicist payload specialist astronaut 1989-1997. 2 spaceflights, 19.7 days in space. Flew to orbit on STS-83 (1997), STS-94..